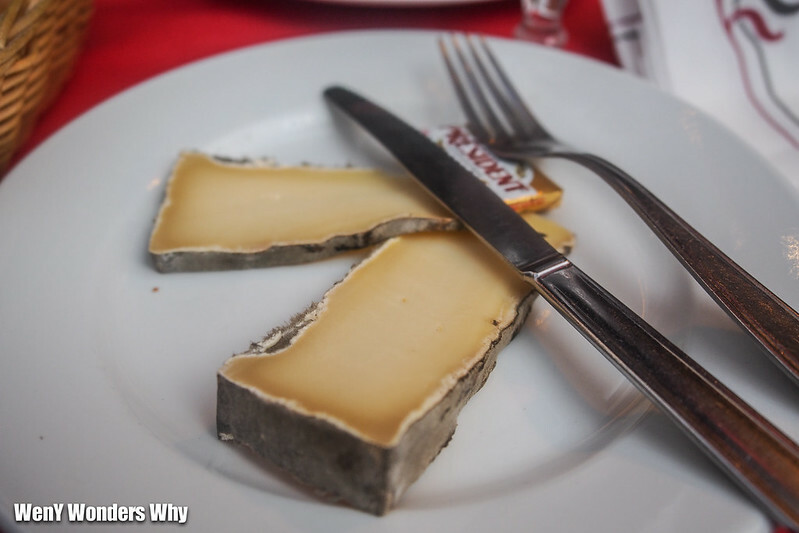 It was the final day in Paris and I was keen to end it with an authentic French lunch. But with no internet to help, I had to walk on foot and decide what was best. Eventually I ended up at Bosc Alain nearby the Eiffel tower area. The 3 course set menu was simple but every bit French. 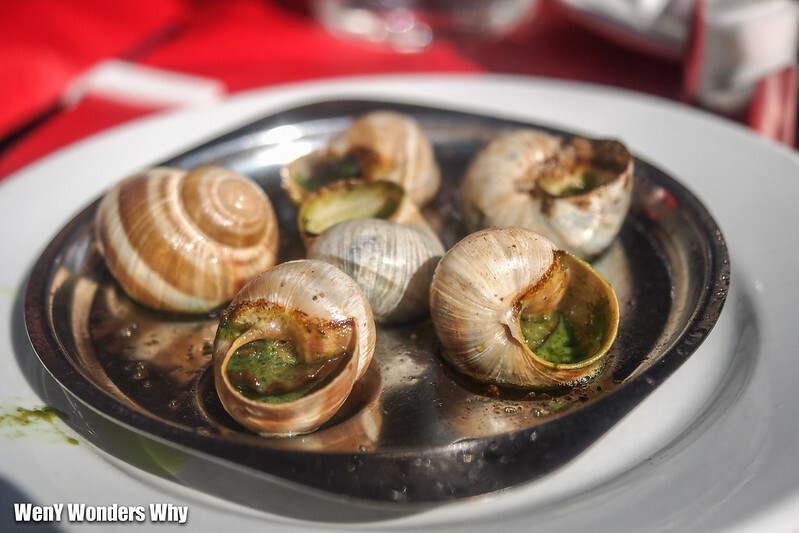 The escargots taste a little earthy, with a mild chew but generous amount of butter and parsley made this dish really tasty while developing a very nice fragrance. While the accompaniments were authentic, I could not help but wonder whether the duck could have been cooked better. The skin was decently brown but a tad longer to let the skin become crisp and fat cook away would definitely be the way to go. But on a positive note, the duck was not overly salty and the frites that came with it were super crunchy and nice. The plate felt bare but I guess the highlight was the cheese anyway. While I was expecting a little sweet side like dates/pear/jam, there was none. Even then, the cheese tasted good! Could have been better for sure. Was it amazing? Well, perhaps no. But my expectations were not the highest as it was a super touristy area where tourists would come by the masses anyway. 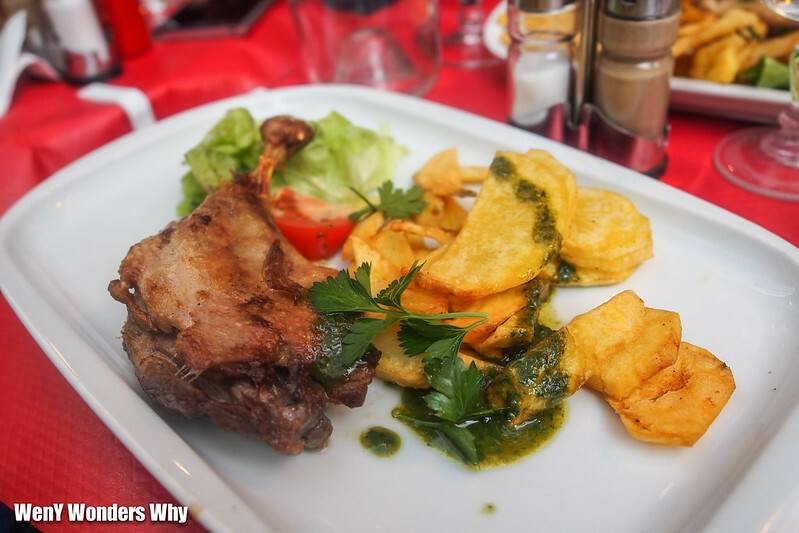 But alas, it was still a decent meal with some notable highlights like the escargots and the duck in some aspects. Having dinner out on Saturday is a big thing and its no different in Paris. With no bookings, you can forget about walk-ins even at 9pm. After getting rejected by one of the more popular bistro’s, we were quite lost. But considering how windy and cool it was that night, we decided to go for a curry meal at Restaurant Buddha just round the corner. I have to say, we were quite lucky because a few patrons had just left leaving us with a couple of tables around. I was salivating when I saw the menu. The food was typically Indian/Nepalese with all the usual suspects. You get the lovely Momo dumplings, Chilli Chicken, Vindaloos, and Briyanis. Eventually we decided to share and called many different dishes. I believe we had the Chilli Chicken, the Momo, a Briyani and a Lamb Korma. Also as the food came out a little slow, Buddha restaurant very kindly served us some Aloo Naan or stuffed naan. Could not be happier at 9.30pm. We literally devoured it the moment it hit the table. That was how hungry we were! 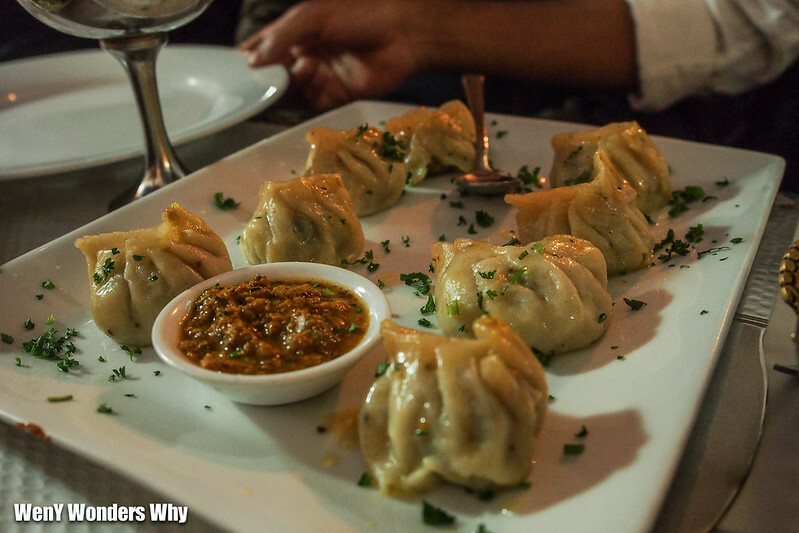 Our platter of Momo’s which is a traditional Nepalese dumpling. 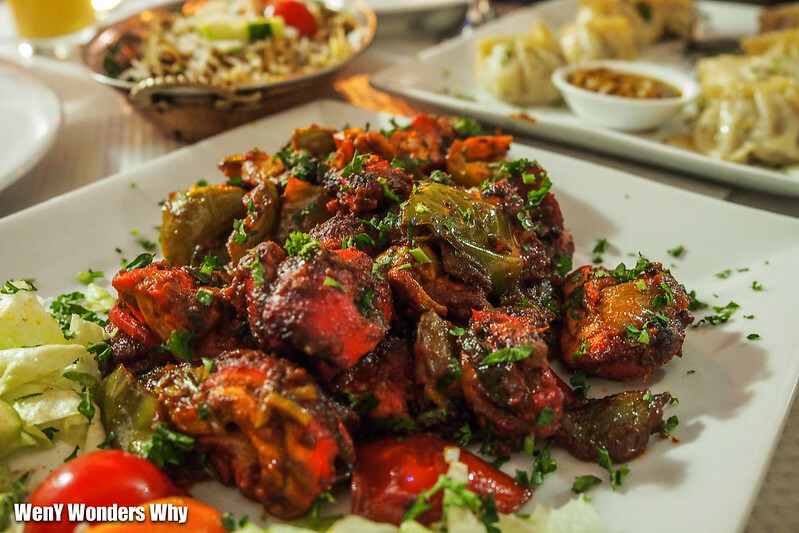 I had it before at Himalayan Nepalese Restaurant in Perth and these were equally tasty! The Chilli Chicken was the highlight of the night. Tender chicken pieces coated in a spicy, sticky sauce that was also mildly sweet. It was very flavoursome. My meal at Buddha Restaurant was every bit satisfying. We ordered a lot and we were absolutely stuffed. 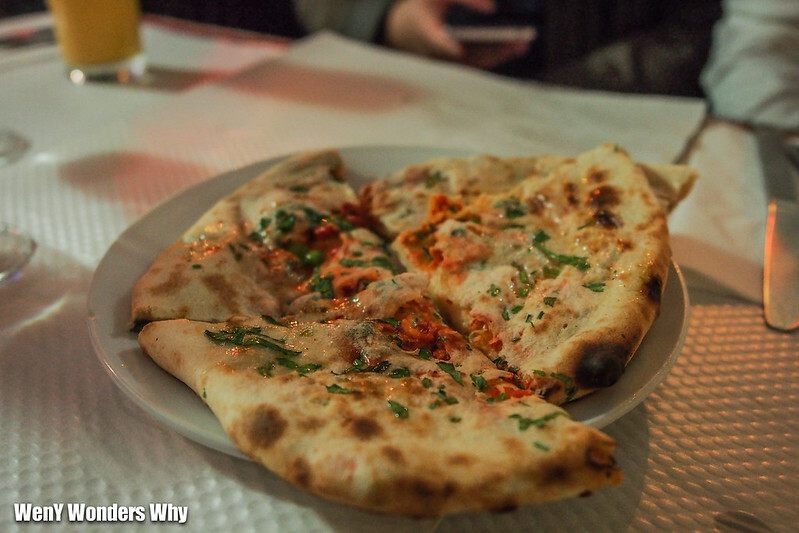 With four mains, several naans and drinks for the table, we paid €25 per person which is considered pretty decent in this side of France. The service was a little slow but it never lacked courtesy for one moment. Buddha restaurant was easily a delicious meal in Paris and I would thoroughly recommend it if you are looking for something beyond the norms of a Parisian bistro. 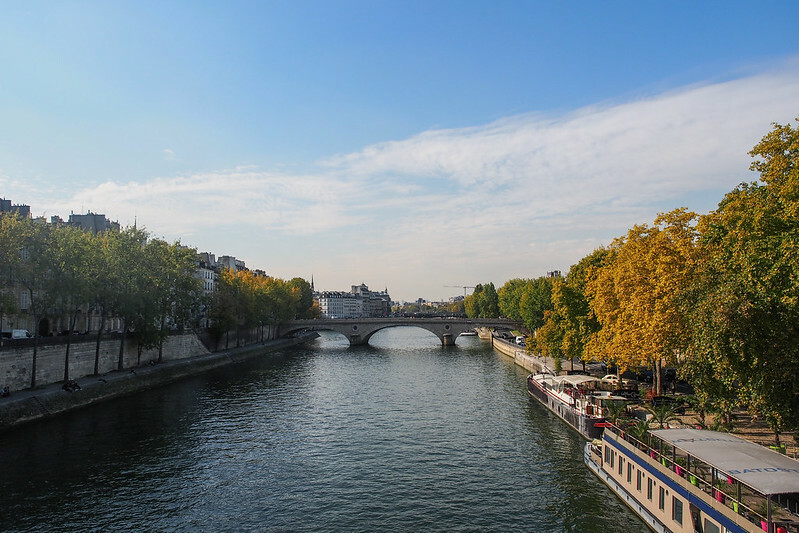 Walking the canals and relaxing by one is a great way to enjoy the relaxed Parisian lifestyle. After a great meal at L’Avant Comptoir, I continued my journey to the Notre Dame Cathedral. Needless to say I was not convinced that the many hours of long queue to see the iconic church from the inside was worth my time. 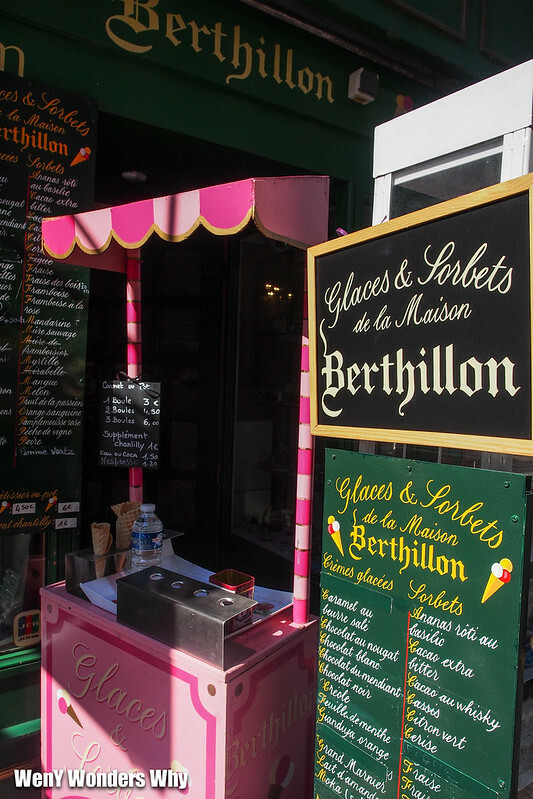 So after quickly snapping a few photos from the outside, I was off to pick up a cone from the famous Berthillon Ice Creamery kiosk. This amazing ice cream shop has been operation for tens of years and rightfully so considering the amazing ice creams they make. While I have been saying a lot of the word “ice cream”, their specialty is actually the amazing sorbet they make. I could not resist getting two scoops that afternoon. The scoop on top was the passionfruit sorbet while the bottom one was a ripe berry sorbet. Both flavours packed some serious fruit flavours. Like Anthony Bourdain puts it, biting into a Berthillon sorbet feels as though you are biting into the frozen fruit itself. That statement I find very accurate as the fruity flavours were really intense! Several of my friends opted for the chocolate ones and thought that it was only “OK”, so it really depends on what you like I believe. But go with the sorbet and you should do just ok! 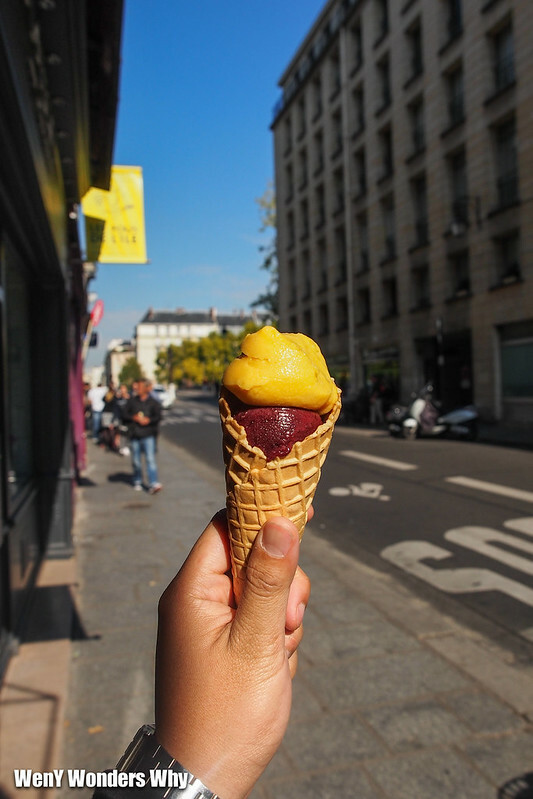 So remember if you are in the Île Saint-Louis area, definitely come-by Berthillon for a scoop of amazing sorbet! After an absolutely rubbish steak by a random restaurant at Eiffel tower the night before, I was more determined than ever to have a proper meal. My research game was strong and brought me to a little tapas bar in town called L'Avant Comptoir in Odeón. Hidden behind a takeaway Creperie, this is a stand only tapas place and strictly no reservations. How to order? L'Avant Comptoir’s standard menu is hung from the ceiling with a price and picture while everything seasonal is written in chalk on a small blackboard. 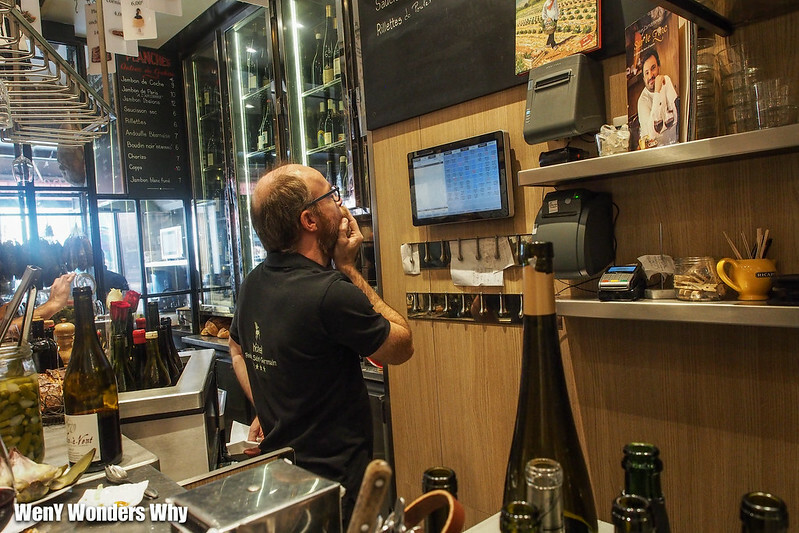 Note that L'Avant Comptoir only has one sommelier, maître d and waiter so its a one man show at the counter. He (Mr Eric) remembers everyone better than you do, so if you feel ignored it is because someone else is waiting before you. This rule applies no matter how sure you are that you were the first in line lol. 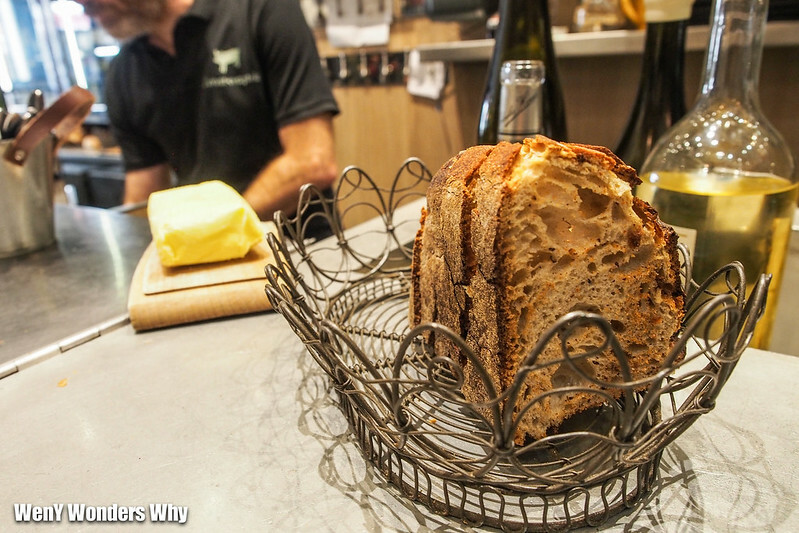 Bread, butter and condiments are communal (and seriously good too) so do not freak out should someone reach over your shoulder to take a slice of bread or smear butter from your tray haha. 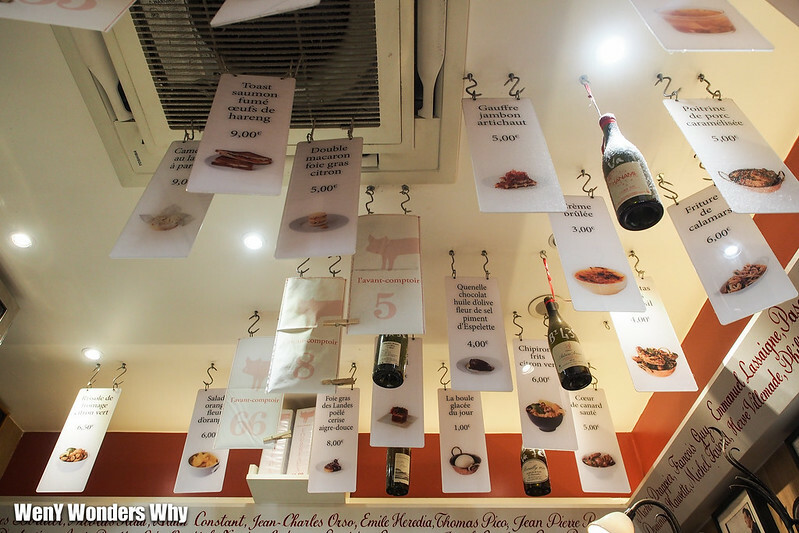 The tapas at L'Avant Comptoir is simple, interesting and extremely flavourful. My first dish was a bowl of super sweet shell fish right which was a seasonal special off the black board. Cooked in a tomato based sauce with wine and finished with a sprinkling of freshly chopped parsley, the shell fish was faultless. Sweet, juicy and mildly briny, this was a great finger food. The second dish I got was a classic favourite for the table, creamy potato croquettes with bits of yummy ham. 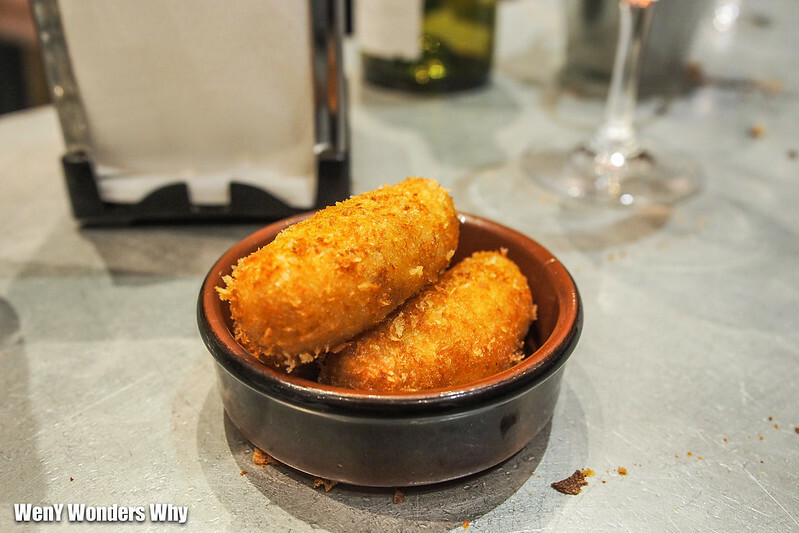 Creamy potato on the inside, crisp on the outside makes the croquette a tapas that is hard to beat. Its seasoning too was balanced and really quite tasty! The Jamon de Paris at L'Avant Comptoir to share with paprika and horseradish. 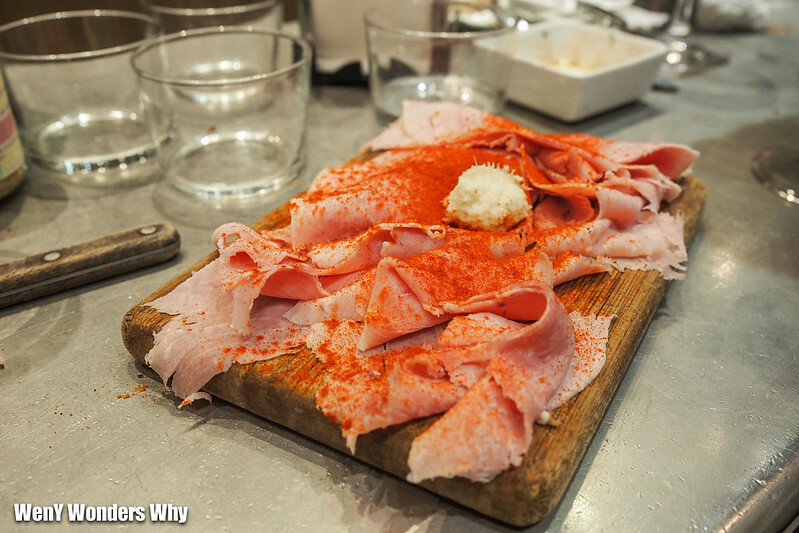 Its hard to explain how a humble ham can make an good lunch become an amazing lunch. But if you appreciate your ham slightly juicy but not wet, mildly salted and intense in flavour, then you will enjoy this a lot! A pinch of horseradish drops a load of kick so do not put too much! My fancy pants attempt at L'Avant Comptoir before dessert was a Foie Gras Meringue with Citrus Jam. Creamy, fragrant and a sweet altogether in one bite. What can I say? Wow. It will be overwhelming for those who dislike the richer things in life but this was a seriously interesting morsel. 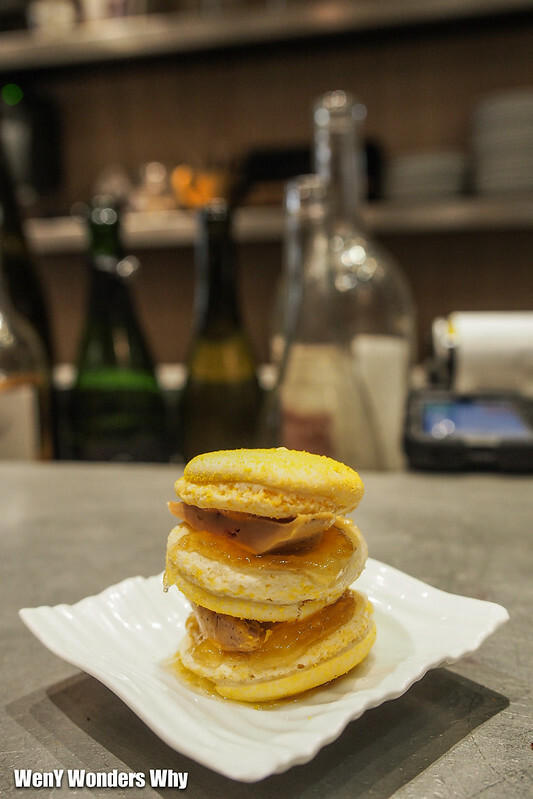 If I had one criticism, it would be that the macaron could be a little thicker! I think there was more Foie Gras than Meringue in this dish haha. 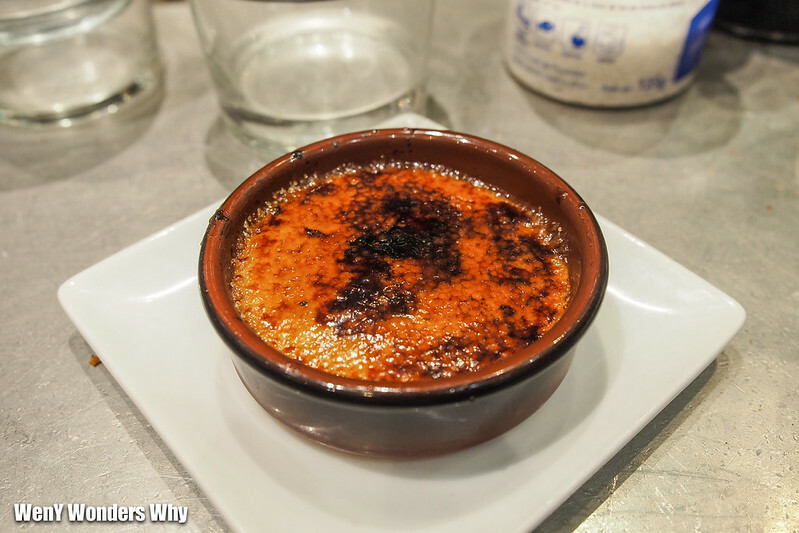 There is no better way to end a great meal but with a sweet ending and when in Paris, eat Burnt Cream or Creme Brûlée. The twist? Creme Brûlée at L'Avant Comptoir is not a really sweet dessert but instead is velvety smooth and simply fragrant. You could smell the burnt sugar the moment the dessert hits the table. After hearing the beautiful crust break, its time to explore the beautiful cream. Spiked with a little coffee, the cream has an aromatic kick that paired perfectly with the burnt sugar. An amazing dessert over all. The wines were pretty good too according to the boys. I thought it was OK but nothing life changing. 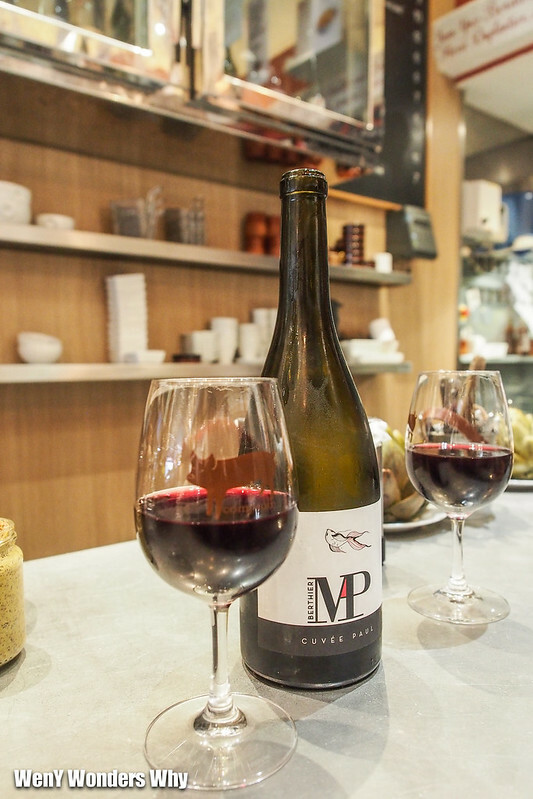 No discrimination of prices between per glass and per bottle, so do not hesitate to try all the different wines L'Avant Comptoir has to offer :)! 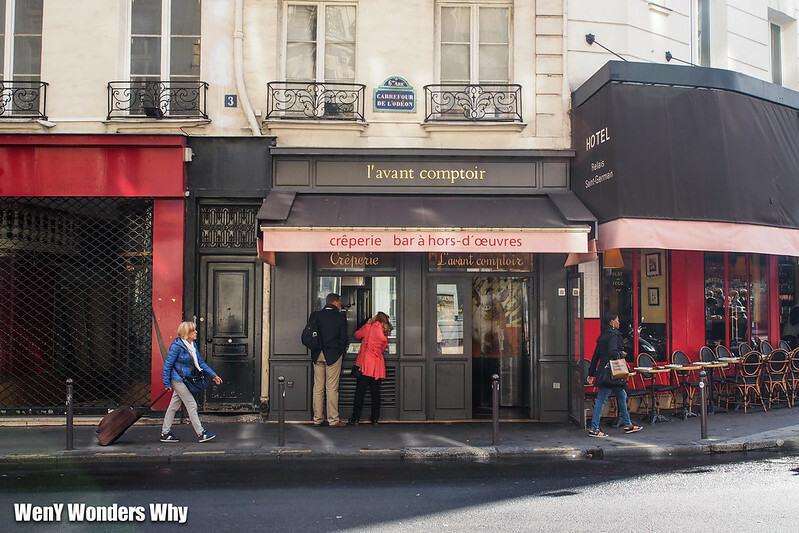 The L'Avant Comptoir was packed at 1pm and several patrons who waited to get in were visibly frustrated by the lack or service or rather no service. So be sure to come 5-10 minute before they open at 12 or risk having to wait. The more popular sitting restaurant next door L'Comptoir St Germain Bistro had people waiting in line since 11.30am!! 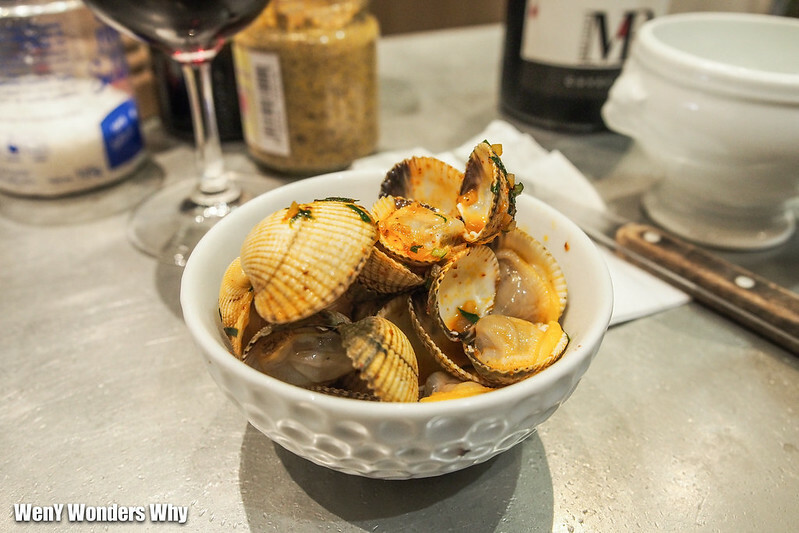 Paris is a big city with plenty of good food. But it has plenty of people too. So queues are a norm and bookings essential where possible. 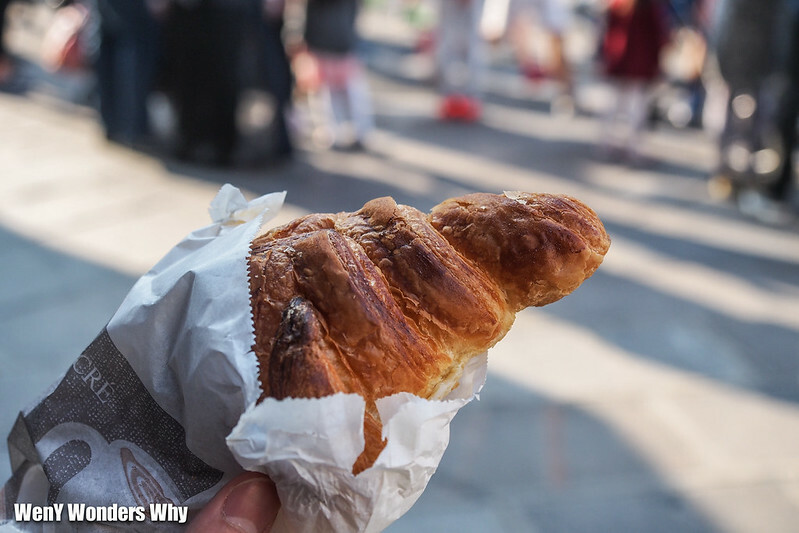 Paris is known as the city of love but it is also known for its amazing food. Many things come to mind when you associate the French with food. You get decadent desserts, Michelin starred restaurants serving the finest meals to quaint little bistros serving classical French food. For me, there was one thing I looked forward to more than the rest when I was there. That is to try their re-known pastries. 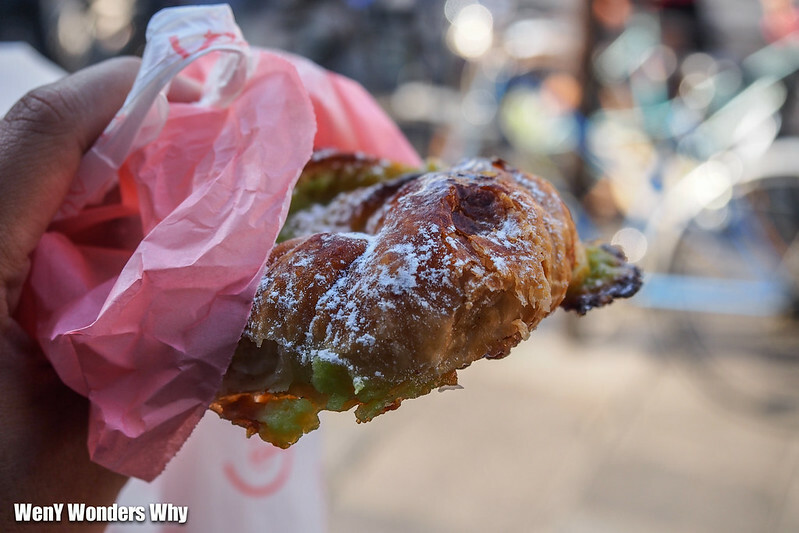 In particular, the much-talked about classic, the Croissant. 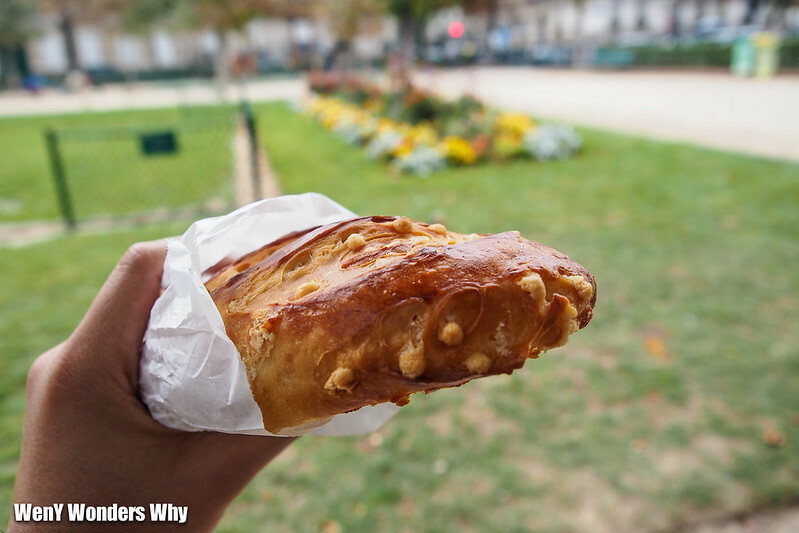 In October, I made a short trip to Paris over the weekend and tried some popular bakeries in town. 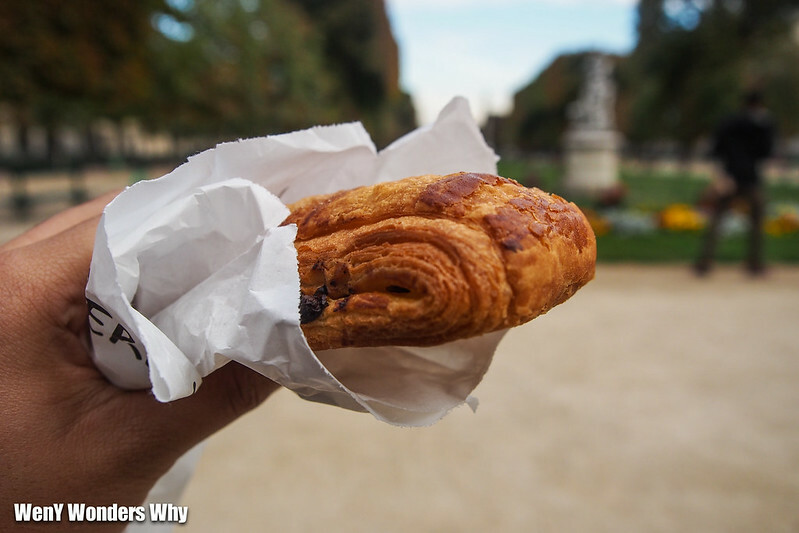 My first morning before walking through Luxembourg Garden was a stop at Maison Eric Kayser on d’Assas road. 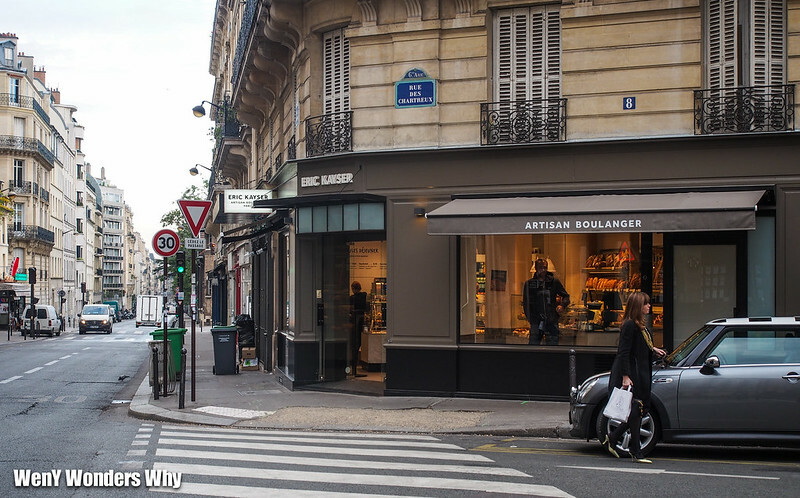 This bakery was one of the many others that formed the famous Eric Kayser franchise. To get my morning fuel, I tried three different pastries. Sorry for the really random looking pics! I was too hungry to re-arrange them and present them nicely together :P! The pastries were rich, tasty and more-ish. But while the Croissant and Brioche should have been the favourites, they were served a little too cold for my liking. This means it was not as fluffy or airy as they could have been. For that reason alone, my favourite was the Raisin & Vanilla Custard Pastry. The morning before I went home came seemingly close to being a failure. With most places closed, it was hard to find anything proper. Then there was the marathon which had several main roads close in the Louvre area. 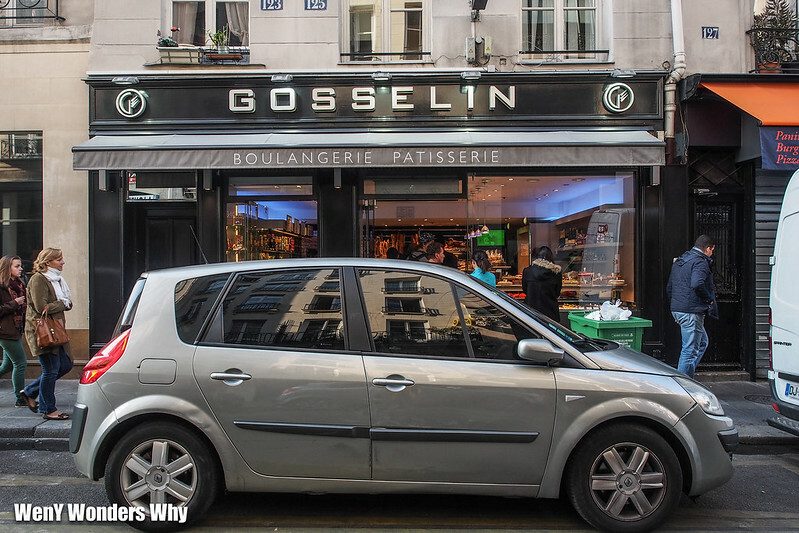 Just when my friends were about to settle for McDonald’s I managed to lead the team to Boulangerie Gosselin. Another moment of decadence in Paris. 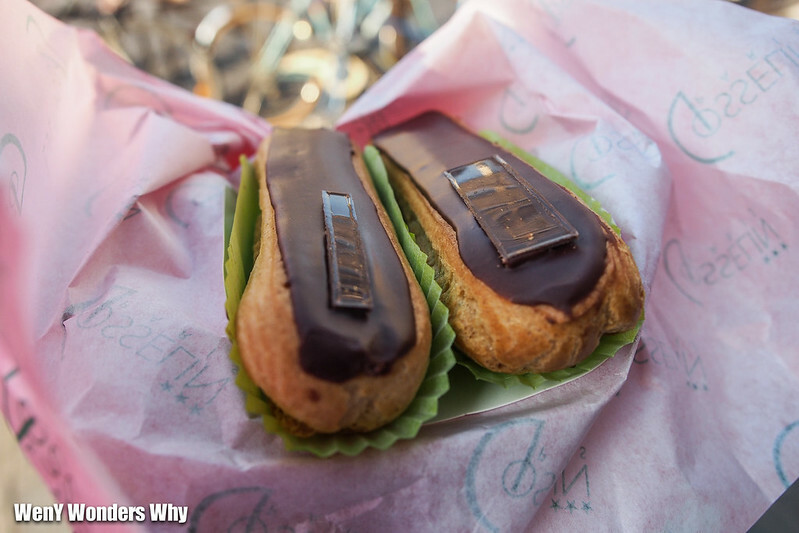 While I have tasted better Eclairs in life, this was a good one although I felt the need for better balance and that it could be fresher over all. 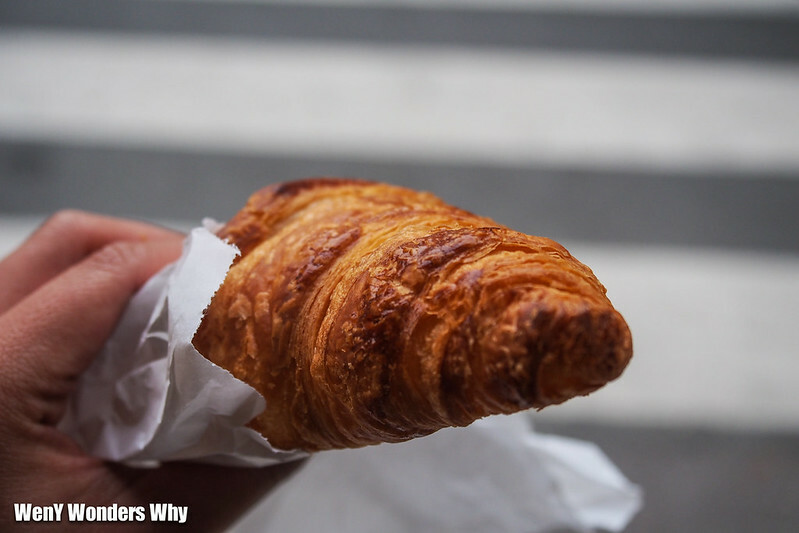 The Croissant here was noticeably airier compared to the one from Maison Eric Kayser. However, it was also less buttery. Alas, my favourite one was the Pistachio Pastry. Crusty, slightly sweet and fragrant, it was a hard one to beat.